Overall size: 24" x 12"
After being spotted by Japanese vessels well before their scheduled launch from the carrier Hornet, the Raiders were forced to launch earlier than planned. This meant that the fuel calculations would fall short of the planned amount for their trip to the original destination of Chuchow, China. Also, their arrival in China would be at night, rather than during daylight, as originally planned. Fortunately, sailors on the Hornet filled ten five-gallon gas cans and passed them hand to hand to each aircraft. This provided the difference between pitching at sea and coming down over land. 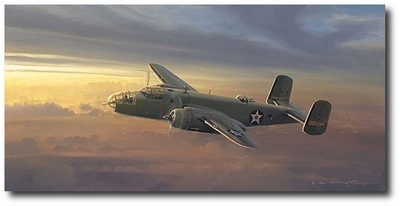 In this painting by William S. Phillips, one of many the artist has completed on the Doolittle Raid, General Doolittle and his crew in aircraft 02344 break into a momentary area of clear sky. The last rays of sunlight bring only slight hope that they will survive their ordeal, as their fuel state becomes critical and the outcome is uncertain. The print was countersigned by the surviving members of Doolittle's Raiders attending the 68th Reunion at Wright Patterson AFB in Dayton, OH, April 16-18, 2010. Hite enlisted September 9, 1940. He was commissioned as a Second Lieutenant and rated as pilot on May 29, 1941. Hite was captured after Tokyo Raid and imprisoned by the Japanese for 40 months. He was liberated by American troops on August 20, 1945 and he remained on active duty until September 30, 1947. Hite returned to active duty during Korean War on March 9, 1951 and served overseas before relief from active duty again in November, 1955. Decorations include the Distinguished Flying Cross, Purple Heart with 1 Oak Leaf Cluster and Chinese Breast Order of Pao Ting. Griffin was navigator on the Whirling Dervish. After a smooth take off and bomb run over the Kawasji truck and tank factory in Tokyo the crew headed for China. They bailed out about 100 miles south of Poyang Lake.